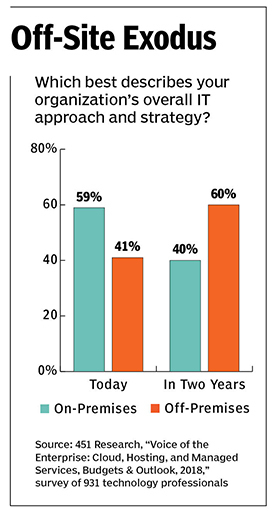 Hardly any software vendors today want to be stuck with an on-premises-only product portfolio. In the ERP subsector, probably the most important technology area for CFOs, it took market leaders Oracle and SAP longer than most to diversify into the cloud. But now they’re leaders there as well. But while the global cloud ERP market is expected to grow, it likely won’t be at a lightning-fast pace. Statista forecasts that the market will be $28.8 billion in 2022, representing an 8% compound annual growth rate since 2016. So far, CFOs as a group — those at large companies, at least — have been fairly reluctant to trust their core financial and operational data to public clouds. 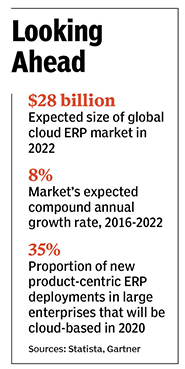 Still, companies’ overall growing fondness for cloud computing could influence faster change in the ERP arena. Research and advisory firm IDC estimates that 70% of companies’ core applications currently run on-premises or in co-location facilities. The rest are in private clouds (23%) or public clouds (8%). In a recent survey by 451 Research, however, 60% of participating technology professionals said they expected their companies’ approach to IT in 2020 would be focused on off-premises cloud solutions. In the ERP market, count Jeff Buchheister among the converted. His company, Cetera Financial Group, replaced its old on-premises system with an Oracle cloud solution in August after an eight-month implementation period. It’s early days, but Buchheister, Cetera’s finance chief, is impressed. Because Oracle, like other cloud providers, handles all of the system’s administration and maintenance, the IT department has eliminated two full-time positions. What’s more, his finance team is reporting efficiencies that he predicts will save him at least 10% on accounting staff costs. A key reason Buchheister chose a cloud solution was to avoid having to keep asking the board of directors for permission to implement upgrades. Automatic upgrades are included in cloud subscription costs. “The cloud solution’s ability to constantly keep us upgraded with new functionality and to keep us from falling versions behind was really attractive,” says Buchheister. Such converts are driven by not only automatic updates and drastically reduced maintenance expenses, but also lower up-front capital costs and faster start-up times for rented software delivered through the Internet. Modern cloud ERP software is more robust than earlier incarnations, as well. As the market has matured, vendors have addressed earlier security fears and added capabilities that have users whizzing in hours through tasks that formerly took days. Still, among organizations that aren’t ready to move to the cloud, some may never be. Many are stepping gingerly, adopting a hybrid approach in which they move some ERP functions to the cloud but keep those that store proprietary data on premises. Still others think the most sensitive data is actually safer in the cloud, but they keep some processes on site. It’s not just fear that is staying the hands of those reluctant to move. When a company moves close to fully amortizing the cost of its old on-premises systems, though, it becomes more likely to migrate to cloud solutions of one type or another. Flavors include a software-as-a-service (SaaS) solution running in a multi-tenant public cloud, a single-tenant private cloud hosted by a cloud vendor, and a private cloud maintained in-house. At such a time, a company wants to understand the financial ramifications of switching to the cloud. The SaaS payment model is a lure for some. Instead of paying an upfront hardware cost and annual licensing fees, cloud users pay as-you-go subscription fees. That said, from a total-cost-of-ownership standpoint, cloud solutions may actually prove more expensive. After five or six years, subscription fees will likely outweigh the ongoing maintenance fees a company would pay for an on-site solution. “If you do a careful analysis, an on-premises solution, while not as easy to implement and maintain, is going to be a lower-cost solution over the long term,” says Jeff Carr, CEO of Ultra Consulting. That assessment, however, assumes that the company will continue to use the on-premises ERP for a lengthy period of time, Carr acknowledges. And, as in the case of Cetera, the opportunity to reduce staffing costs could be an important factor in going with a cloud ERP solution. Another factor lifting cloud ERP sales is the fact that other enterprise applications already run in the cloud, as do myriad consumer products that people feel comfortable using online. Once eyed skeptically as a potential security risk for the kind of sensitive data that’s in an ERP system, cloud software is now perceived as much more mainstream. Perceptions have slowly changed as vendors have touted encryption capabilities and the enhanced security protocols available on cloud platforms like Amazon Web Services. “In corporations that rely on on-premises solutions, adherence to updates and compliance often lags those that are well maintained by a software vendor,” says Juergen Lindner, vice president of SaaS at Oracle. Access to new technology rounds out the list of reasons firms are adopting cloud solutions. 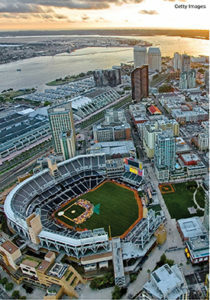 When the San Diego Tourism Authority moved past its 10-year-old, on-premises ERP system, it was able to meet a savings target of $200,000 because of reduced capital and maintenance costs. The organization also valued features that helped streamline business processes, including a user-friendly interface and dashboards that made it easier to monitor the status of transactions. The accounting team now can load banking data daily, enabling daily reconciliations. “The monthly closing process has been accelerated to only an hour or two, as much of the subledger accounting and posting is done throughout the period instead of period-end,” says CFO Richard Meza. All of the benefits aside, the road to cloud ERP can be rockier than one might expect. Eric Kimberling, CEO of Third Stage Consulting, cautions CFOs not to underestimate the effort involved. The cloud doesn’t automate the necessary redefinition of business processes or aid in getting up to speed on how the new software works. “Those are the two hardest parts of any sort of transformation,” he says. Ironically, another cloud issue that takes some companies by surprise is the trouble that can arise from automatic software updates. Dalsin Industries, a sheet-metal fabrication contract manufacturer, moved from an on-premises Epicor system to a Plex cloud ERP in 2012. Two years later, it moved back on-site with Epicor. Keith Diekmann, Dalsin’s vice president of technical operations, was initially excited about automatic updates. But they turned out to be not so much the answer to a thousand prayers as the subject of countless obscenities. Specifically, he found the lack of control over them to be frustrating. Updates sometimes broke parts of the system that his team would then have to fix. Plex — which recently announced it would shut down its Plex Cloud service on November 30 — did send notices about updates, but made no mention of the associated potential for breakage in the system, says Diekmann. Dalsin’s decision to revert to an on-premises system was significantly influenced by dissatisfaction with the Plex product’s standard costing method. But Diekmann is relieved that his team can again test system updates in a virtual environment before going live with them. Hybrid solutions, where some functionality is on-premises or in a private cloud and some in a public cloud, can present a different set of problems. For one, connecting the disparate types of software can be difficult. “Being able to integrate in an intelligent, cost-effective way that links the right data and makes sure it’s accurate and seamless is one of the most challenging aspects,” says Kerrie Jordan, senior manager of product marketing at Epicor. Traeger Grills learned about the difficulties of hybrid implementation the hard way. In 2015, the maker of wood pellet grilling systems dumped its on-premises system and began using an Epicor solution running in a private cloud. It kept its integration applications and proprietary data in a public cloud. Newman admits management didn’t start with a sound integration strategy. At one point, he says, 75% of IT staff time was being spent integrating platforms. Rather than change some non-standard business practices to match the best practices built into the Epicor system, Traeger implemented customizations. “We forced the system to do things it wasn’t built for,” says Newman. The result was “havoc,” he says. For example, the company had lots of interfaces with third-party software packages, such as an e-commerce system and a point-of-sale system for events. The data architecture around those broke, so in some cases the company lost orders. In others, it failed to take payments. Newman got to work with his team and dissected all of the interface connections to see what went wrong. Eventually, they unified the connections into one consistent interface with the Epicor system. But it took two and a half years to put out all the fires. 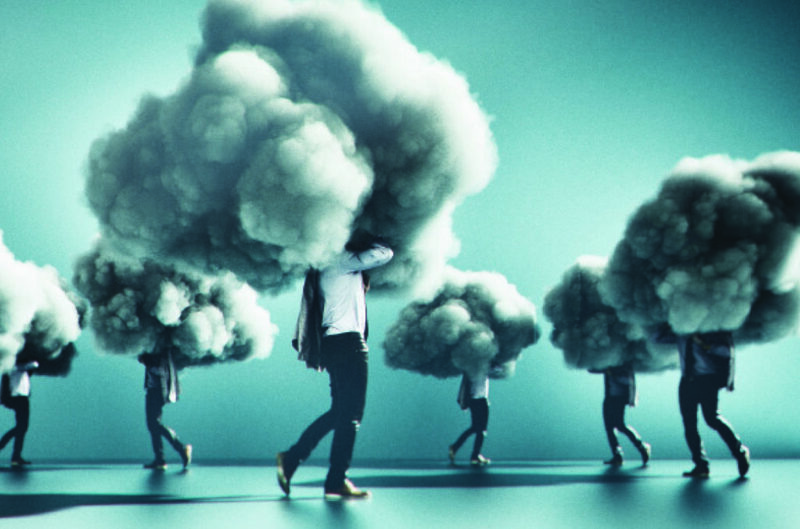 Companies that do opt to enter the cloud should “realize it’s a business project, not a technology project,” says Geoff McPherson, director of client services as Panorama Consulting. Here are some tips for optimizing the journey. Lay the groundwork. Before even beginning to look at vendors, think about the company’s goals and how to reach them. Consider what happens to people’s roles once a new system is in place and their tasks are eliminated. Will you retrain them? How can you keep the workplace from descending into nervous rumors? “These projects get out of control because people haven’t thought about the human aspect,” warns McPherson. Lead and prioritize. Upper management needs to decide how important it is to go through this type of transformation. “It’s got to be the number one or two priority,” says McPherson. Get users involved. Cetera brought in temporary help to backfill the roles of six employees in the accounting department — including the controller and the heads of accounts payable and accounts receivable. They were sent to a war room to focus on the implementation process. Meza, the CFO at the San Diego Tourism Authority (SDTA), had his accounting team run tests to verify that balances were completely migrated from the old system. “The team tested every account to ensure accurate conversions rather than relying on sample testing,” says Meza. Exposure to the new system was also an efficient way to get the team comfortable with its functionality and processes. Invest in training. Traeger’s Newman brought in system experts knowledgeable in both specific business processes and the Epicor system the company was adopting. One consultant shadowed the Traeger accounting team for a week to identify business processes that weren’t working well and recommended fixes on the spot. He also identified where the system wasn’t meeting the team’s needs and customizations were justified. Keep customizations to a minimum. Many customizations requested by multiple customers aren’t needed anymore because they’re baked into ERP software as best practices. The few legitimate ones are unique to an organization and offer a competitive advantage. “Think of them as [part of] the company’s secret sauce for how it interacts with customers or differentiates its product,” says Kimberling. The SDTA went into its cloud migration aiming to to minimize customizations and simplify processes. It scrapped its old CRM customizations and streamlined its general ledger, decreasing the number of accounts. It also closed all older requisitions and purchase orders and simplified order entry and revenue recognition rules. As well, the budget process was streamlined to take advantage of the new system’s ability to create standard look-up tables that the organization uses to provide a list of approved budget descriptions to the users, says Meza. All expenditures are required to be reported against an approved budget description. That makes the monthly reconciliation to budget more efficient and accurate, he adds. Overall, as companies continue to retire legacy on-premises systems, they’ll have to mull lots of pros and cons before deciding what comes next, and to avoid making key mistakes along the way. The choices they make may have much to say about how well they’ll be able to leverage modern software systems to the future benefit of their businesses. 1. Establish goals for your ERP project. 2. Build a cross-functional team composed of everyone who will use the system to guide the process of choosing the right cloud ERP for the company’s needs, identifying reports, and assessing data elements for the integration. 3. Take an inventory of current data elements throughout all departments. Back up all data. 4. Review the business processes you are seeking to improve. Cloud ERP makes processes go faster, but making a bad process faster is just increasing the speed of frustration. 5. Add extra time for project completion. Questions, broadening the scope of work, and minor glitches all take time to address. 6. Share all documentation, data dictionaries, and other information with your integration partner. The more information that is shared the better. 7. Look for a cloud ERP vendor with a proven history of successful transitions for companies in similar industries. Ask for and check on references. 8. Allocate extra time for training groups and individuals who will use the system.